Bajaj Allianz stood out as the frontrunner of this year’s Global Leadership Award for leveraging imaginative learning. 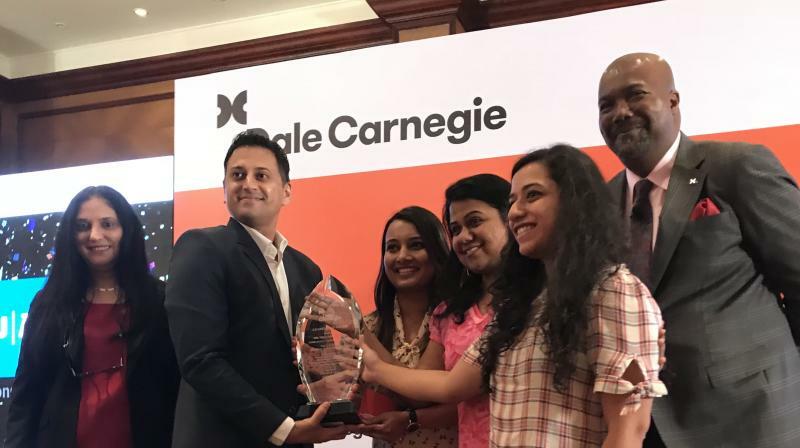 Mumbai: Dale Carnegie of India has announced Bajaj Allianz General Insurance as the winner of the prestigious Dale Carnegie Global Leadership Award 2018. The first runner-up award was presented to Infosys BPM and Cisco Systems bagged the second runner-up award. The top 6 nominees shortlisted for the award also included The Lalit, L&T Technology Services and Hindustan Petroleum Capital Limited. The event began with an introduction and welcome speech by Ms Pallavi Jha, followed by the launch of the brand new Dale Carnegie Book on L&D Best Practices. The book articulates the vision of HR and business leaders who are at the cutting edge of innovation and disruption with regards to L&D initiatives being practiced within their organizations. Commenting on the awards, Pallavi Jha, Chairperson & Managing Director, Dale Carnegie of India said, “We are extremely happy to announce Bajaj Alliance General Insurance as the winner of this year’s Global Leadership Award, as their efforts toward people development are at the forefront of today’s L&D landscape. The aim of the Global Leadership Award has always been to recognize the efforts put in by organizations toward the advancement of their most important stakeholders – the employees.